I was having a conversation with a mate the other night about what Brexit means for Scottish independence. This mate, however, is an American. Because when American politics are depressing and nonsensical, we turn to British pol—wait, never mind. Despite the overall UK vote to leave the European Union, Scotland (and London, and Northern Ireland) voted overwhelmingly to remain. But since part of the whole vote no to independence thing was remaining part of the EU thing, shouldn’t Scotland now be well positioned for IndyRef2? I read this article from the Guardian back in January and meant to share it with you all, but I somehow forgot about it. So at long last, it turns out no, not so much. The whole thing is worth a read; it uses YouGov survey data to break out voters into different camps. And what sort of nails the argument is this graphic. 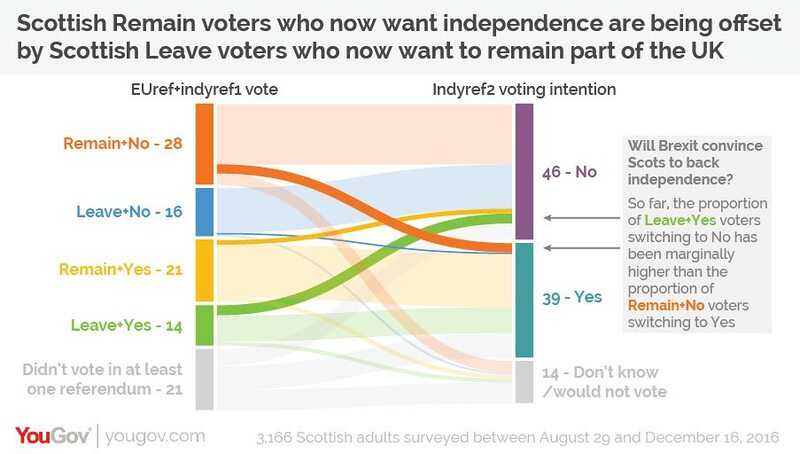 There are four/five groups of Brexit/IndyRef1 voters that then get sorted into two/three IndyRef2 results (yes, no, maybe I don’t know?). And what you can see is that yes, a significant number of those who voted to Remain in the EU, but voted no to Scottish independence would now vote for independence. But, an almost equal number of those who voted to Remain and also voted for Scottish independence would now vote against Scottish independence. In effect, these two voter movements are cancelling out any potential gains for a future Scottish independence vote. Credit for the piece goes to the YouGov graphics department.